When I posted the recipe for Giant S’mores Cookies on Wednesday I whined about going back to work and informed you that it was going to be a week filled with ooey gooey s’mores. Well, I am back today and this recipe is sure to please. 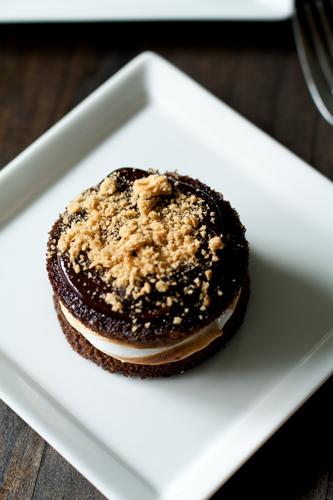 This time I am giving you a recipe for S’mores Whoopie Pies. These little cuties are still just as scrumptious and messy as the campfire favorite, but are a little upscale in presentation and in flavor. These are best served on a plate with a fork, as eating them with your hands may cause a chocolate-marshmallow crumb trail throughout your house. For this recipe, I adapted a cake recipe from Hershey’s, sandwiched the mini cakes with marshmallow frosting and topped them with a spoonful of ganache and graham cracker crumbs. This is a lengthy recipe and takes a little bit of time and patience due the multiple steps, but I definitely think the end result is totally worth it. If you don’t have a whoppie pie pan, I wouldn’t use the cake recipe that I provided; the batter is really thin and it won’t hold its shape unless it is baked in some sort of pan. If you are a pan addict like me, you can pick up a Whoopie Pie Pan at Williams Sonoma for about $20. I’ve been on a little whoopie pie kick since purchasing the pan from Williams Sonoma, so definitely stay tuned for more delectable and adorable whoopie pie recipes. Be sure to pop back over this weekend to check out my final S’mores recipe of the week. Have a great weekend! 1. Heat oven to 320 F. Spray your whoopee pie pan with non-stick cooking spray. Stir together sugar, flour, cocoa, baking powder, baking soda and salt in large bowl. Add egg, milk, oil and vanilla; beat on medium speed of mixer 2 minutes. Stir in boiling water (batter will be thin). 2. Pour 1 ½ tablespoons of batter into each well of the whoopie pie pan. 3. Bake 8-10 minutes or until wooden pick inserted in the center comes out clean. 4. Cool for 10 minutes in the pan then invert the pan and allow the whoopies to cool completely on wire racks. 5. Wash and dry the pan and re-spray with non-stick cooking spray and repeat with the remaining batter. You will end up with 36 whoopie cakes that once sandwiched will yield 18 whoopie pies. 6. Once your whoopies are cool, prepare the marshmallow frosting. 1. Place egg whites, sugar, and cream of tartar in the heatproof bowl of an electric mixer. Set over a saucepan with simmering water. Whisk constantly until sugar is dissolved and whites are warm to the touch, 3 to 4 minutes. 2. Transfer bowl to electric mixer fitted with the whisk attachment, and beat, starting on low speed, gradually increasing to high, until stiff, glossy peaks form, 5 to 7 minutes. Add vanilla, and mix until combined. Place the chocolate into a medium bowl. Heat the cream in a small sauce pan over medium heat. Bring just to a boil, watching very carefully because if it boils for a few seconds, it will boil out of the pot. When the cream has come to a boil, pour over the chopped chocolate, and allow to sit for a few minutes. Whisk until smooth. 1. Pipe filling on the flat sides of half the cakes (18 of them). 2. Use a kitchen torch to lightly toast the marshmallow frosting. Top each with one of the remaining cakes; flat side down. 3. 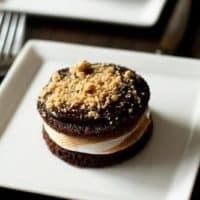 Place a spoonful of ganache on top of each whoopee pie and spread in a circular pattern; garnish with graham cracker crumbs and allow the ganache to set up. - I wish the whoopies would have domed a bit more; so I am experimenting with different cake recipes. - These are definitely best served the same day and do not react well to heat. I stored my uneaten pies in the fridge and they were okay the next day, just definitely not as good as the day they were made. Oh wow… I’ve never had whoopie pies before. I want one. now. I’m gonna have to venture into making them after this. I won’t be able to get them off my mind. They look great! This dessert has left me almost speechless. YUM! WOW. This is incredible. I always thought s’mores has peanuts in it, which is why i usually stay away from those recipes as i have a nut allergy, but i am so glad i checked this as it is just so……. I cant quite find the right word for the thought that is going through my mind right now……………. Mouth watering! YUMM! Seriously! We want to buy the Whoopie Pie pan from Williams-Sonoma too! These amazing looking cookies, er, whoopies are the perfect excuse! Thank you for posting and beautiful presentation and photos! I love these!! MUST try like now! Agh these look so good!! These look amazing and I learned something new: there are whoopie pie pans! How fun! I am glad this recipe made you experience a “seat jump” thanks so much for stopping by! I was wondering; noticed you used a muffin top pan for the previous recipe; thinking it could also serve for whoopie pies? What is the difference? Although they appear to be very similar, the wells in the Whoopie Pie Pan are much smaller than the wells of the Muffin Top Pan. I love the toasted edges. Beautiful shot! And to think I never knew there was a whoopie pie pan! (Note to self: Must go shopping more.) This is an awesome recipe- I love that the marshmallow filling is toasted even! Thanks for sharing- these brought a smile to my face! I love s’mores and I love whoopie pies..who woulda thought to combine em?! Genious! 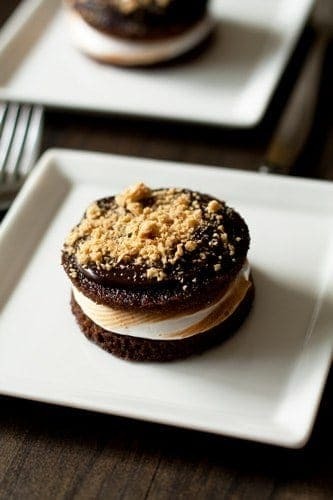 I’ve seen other s’mores whoopie pie recipes before, but yours is the first with the ganache and graham cracker crumb topping. I LOVE that. Looks like I’ll have an excuse to buy another specialty pan, I already want a muffin top pan for your other s’more recipe! Wow, these look spectacular – yum! Wow these look much too good to eat =) Gorgeous! I wish I’d seen this earlier – I just threw away a bunch of unused egg whites! OK, this recipe almost caused me to lick my computer screen!!! I picked up two whoopie pie pans from Sur la Table recently and am thrilled to have yet another recipe to try! Definitely stop back and let me know how you liked them! whoopie pies are the new cupcake! these are pretty much the most gorgeous whoopie pies I’ve ever seen! Whoopie pies really seem to be the next big trend- I keep seeing them everywhere! Do you serve them with anything in particular? Looks yummy! One question…there is no water in the frosting recipe?? Nope, no water in the frosting. Have a great weekend. So you mentioned that these tasted not as awesome the day after. Was it the cake part or the frosting that wasn’t as great? Honestly, it’s been so long since I made these that I don’t remember exactly which component wasn’t all that great after they sat overnight. Sorry I’m not more a help. Could I use a muffin pan and not fill it very much? I hate to buy another misc pan. Kate, whoopie pies should form okay on a regular baking pan as well. No need to make them in a muffin pan. The batter will hold up on a flat baking sheet, they may just be ovals instead of perfect rounds.